🔥 All Proline Shirts 15% Off For A Limited Time! We are dedicated to bringing you high quality products in the pursuit of protecting our oceans through global conservation efforts. Ultra-soft feel, cool and comfortable men’s performance long sleeve fishing shirt. Each long sleeve t-shirt is printed using Enviro Safety Water based Dye, then hand cut and sewn one at a time to your specific order request. We guarantee that the clothing will surpass any regular print and will never peel, crack or flake. Our performance apparel fabric stretches when you need it so your movement is never restricted. Each garment is made using the highest quality fabrics and dye sublimated with state of the art printing technology. Our cooling fabrics works great to keep you cool and comfortable while giving you a barrier of protection against the rigors of the sun and ocean environment. Proudly Made in the USA, 100% Percent Microfiber-Poly, Moisture wicking technology, Odor resistant, Stain release, Sun protection UPF50 Rating. Ultra-soft feel, cool and comfortable men’s performance long sleeve fishing shirt. Mahi fish with Mahi pattern on sleeves and around bottom of shirt. Each long sleeve t-shirt is printed using Enviro Safety Water based Dye, then hand cut and sewn one at a time to your specific order request. We guarantee that the clothing will surpass any regular print and will never peel, crack or flake. Our performance apparel fabric stretches when you need it so your movement is never restricted. Each garment is made using the highest quality fabrics and dye sublimated with state of the art printing technology. Our cooling fabrics works great to keep you cool and comfortable while giving you a barrier of protection against the rigors of the sun and ocean environment. Each garment is literally a wearable work of art coming to life. Our clothing is proudly made in the USA. This performance shirt is created using moisture wicking technology. It’s odor resistant with stain release qualities designed to deliver maximum performance. UPF rating of 50 to protect you from harmful UV rays. Machine washable for easy care! 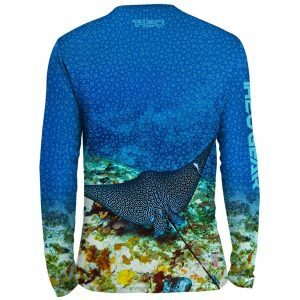 Anglers will love this long sleeve fishing shirt not only for fishing, but for any outdoor activity. Made in the USA, 100% Percent Microfiber-Poly, Moisture wicking technology, Odor resistant, Stain release, Sun protection UPF 50 Rating. Click here to see more Mahi designs. Tony’s comments will be added shortly. Sign up now to be the first to hear about special offers, giveaways, latest news, and much more!